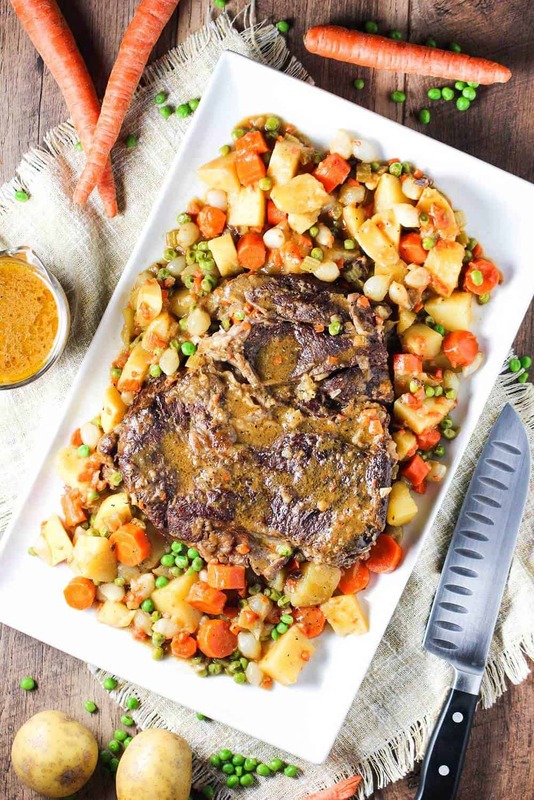 American Pot Roast is such a beautiful and satisfyingly delicious meal. 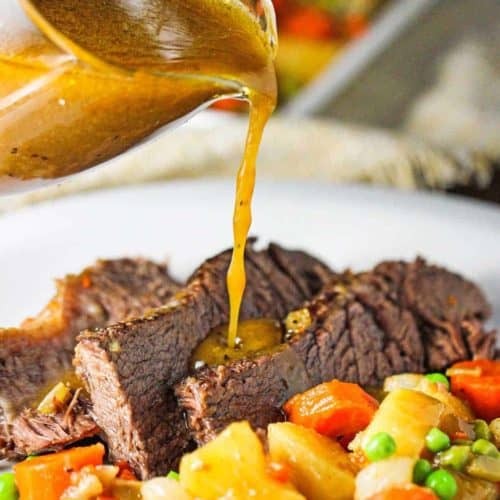 This recipe takes a humble chuck roast and slow cooks it to a fork-tender, flavorful finished dish that just can’t be beat. This has been one of our favorite ways to prepare a roast for many, many years. We think you’ll like it a lot, too. As mentioned, you don’t need to run out and buy an expensive cut of meat for this American Pot Roast recipe. 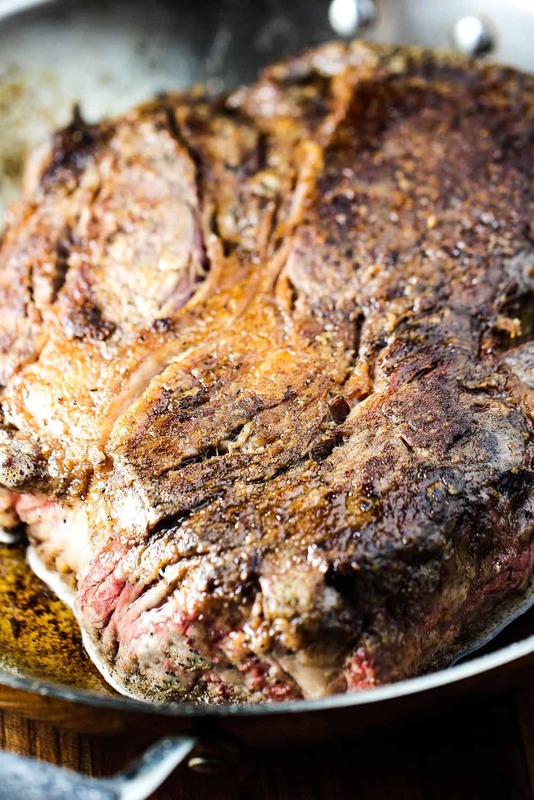 A 3- to 4-pound chuck roast works perfectly. Searing the roast first locks in flavor and creates a beautiful crust on the outside of the meat. Mmmmm. The name of this dish, American Pot Roast, is actually a little misleading…the meat is braised, rather than roasted. 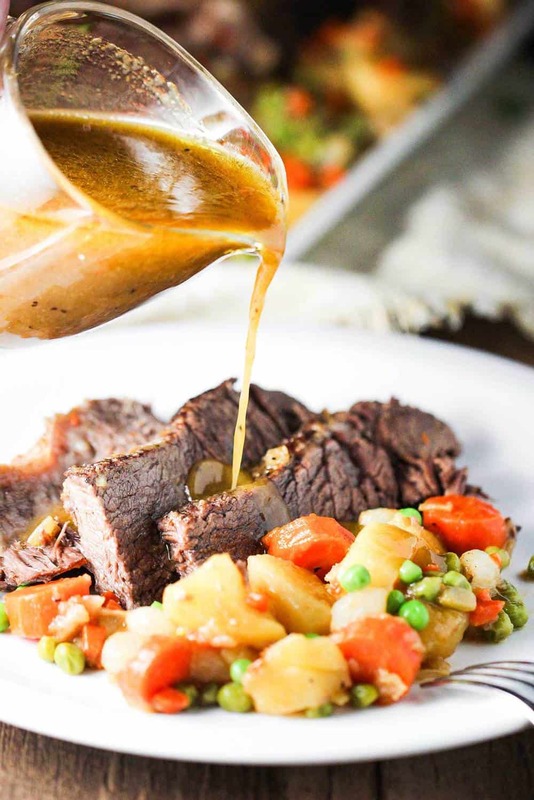 The beef stock, along with the sautéed vegetables, add so much flavor to the roast as it slowly cooks in the oven, or slow cooker. We prep the carrots in two different ways: First, a fine chop for slow cooking the roast. And then, a larger, thick cut, for finishing off with potatoes and peas. This takes a little extra effort, but makes a big difference in the final dish. 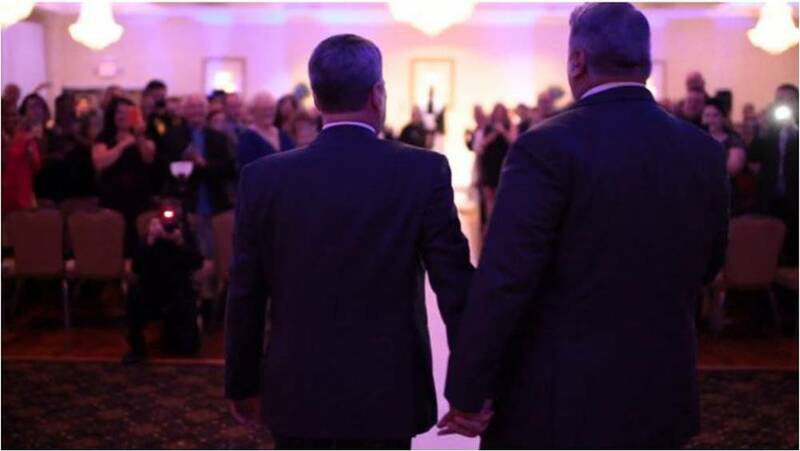 It all works together so wonderfully. And the smell as it cooks in incredible. 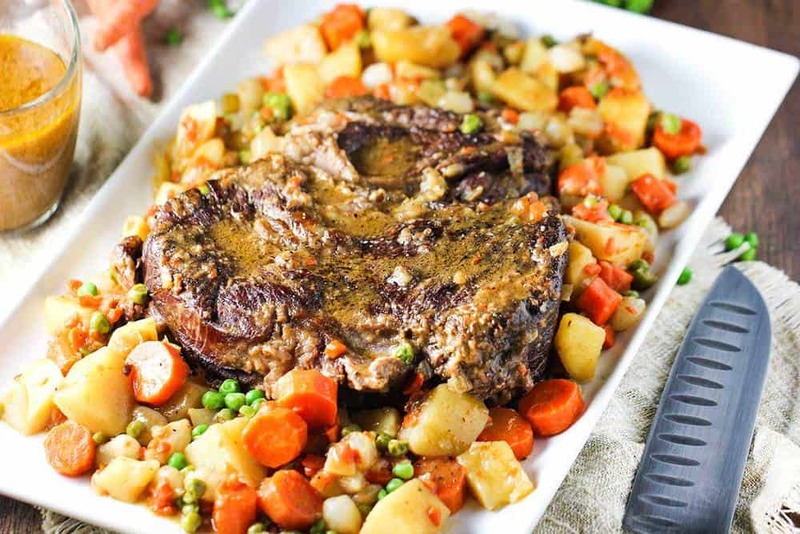 This American Pot Roast has Sunday dinner written all over it. And then just wait for left-overs the following days. This roast makes the best roast beef sandwiches you can imagine! Next, strain the liquid and then simmer the sauce until just slightly thickened. 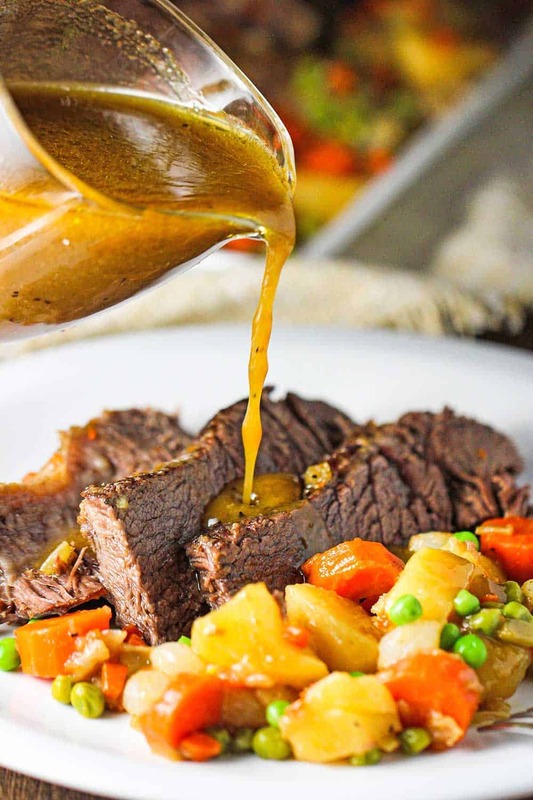 The sauce is to die for and this American Pot Roast is comfort food at its very best. Another amazing Pot Roast is our Italian Pot Roast. So good! This American Pot Roast is so fork-tender and exploding with flavor. Slow-cook in your Dutch oven (or roasting pan), or your slow-cooker, and you won't believe the results. Incredible! 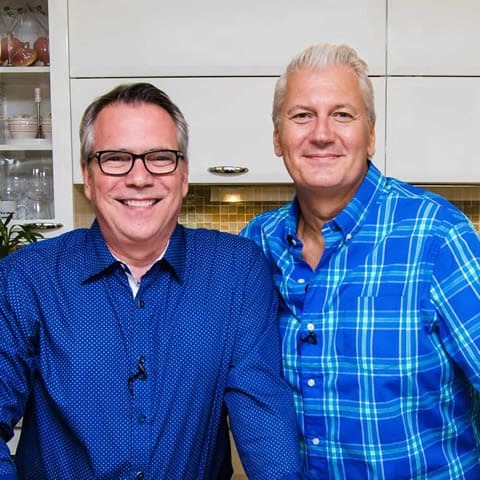 In a large bowl, stir together 3 tbsp of the flour, 1 tsp salt, and 1/2 tsp of pepper. Turn the roast in the seasoned flour, shaking off any excess. In a large frying pan, over medium heat, melt the butter with the olive oil. Add the roast and cook, turning occasionally, until browned on all sides, about 10 minutes. Pour off all but 2 tbsp of the oil in the pan. Add the finely chopped carrots, yellow onion, and celery...and saute over medium-high heat until softened, about 5 minutes. Stir in the remaining 2 tbsp of flour and cook for about 1 minute. Pour in the beef stock and deglaze the pan, stirring and scraping up the browned bits on the bottom of the pan. Transfer the roast to a large Dutch oven, or roasting pan. Pour the vegetable and stock mixture over the roast. Cover and place in the oven for 2 and 1/2 hours. Remove from the oven, uncover and stir in the potatoes, large carrot pieces, and pearl onions. Cover and cook for 30 more minutes. Uncover and stir in the peas. Cover and cook until the vegetables are tender, about 15 minutes more. Transfer the roast to your slow cooker. 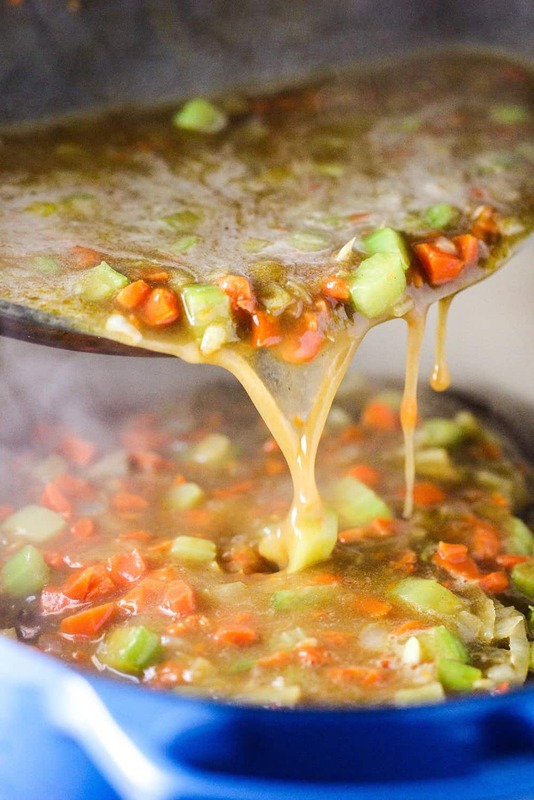 Pour the vegetable and stock mixture over the meat and cook for 4 hours on high or 8 hours on low. Uncover and stir in the potatoes, carrot pieces, and pearl onions. Cover and cook until all the veggies are tender, about 15 minutes longer. Transfer the roast to a cutting board and cover with aluminum foil to keep warm. Use a slotted spoon to remove the potatoes, large carrot pieces, onions and peas. Place in a large bowl and sprinkle salt and pepper all over (don't over salt). Cover with foil to keep warm. Use a large spoon, or ladle, to skim as much fat as possible from the surface liquid. Strain the cooking liquid through a fine-mesh sieve, or a colander with cheese cloth, discarding the excess solids. Bring the strained liquid to a boil over high heat and cook until the liquid is slightly thickened, about 10 minutes. Place the roast on a serving dish and then arrange the roasted veggies around the meat. Drizzle the sauce over the meat and veggies. Slice against the grain and serve at once, passing gravy at the table.